Ever wonder what beer tasted like during the Prohibition period? Well now you can. 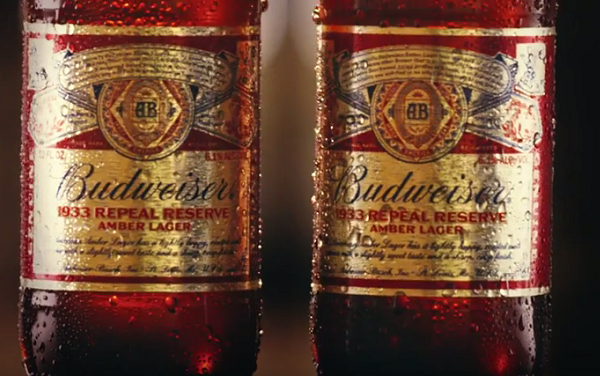 Budweiser is giving beer lovers the chance to experience and taste history with the release of its limited-edition 1933 Repeal Reserve Amber Lager. The recipe behind Repeal Reserve dates back to the pre-Prohibition era when Adolphus Busch created and brewed a special Amber Lager for his friends and local community to enjoy. Due to the onset of Prohibition in 1920, the beer didn’t have a chance to be distributed widely outside the St. Louis area… until now. Beginning today, Budweiser is releasing this historically inspired recipe nationwide to celebrate the Repeal of Prohibition. The Prohibition era marks a defining moment for the Great American Lager, as the brand, and the country, faced 13 years without a drop of beer. Budweiser’s limited-edition 1933 Repeal Reserve is brewed to recognize and raise a cold one to America’s determination through Prohibition. The amber lager consists of a light, hoppy aroma and a rich caramel-malt taste. As a nod to the pre-Prohibition era, Repeal Reserve boasts a higher ABV than original Budweiser – 6.1% vs. 5%. And, inspired by the earlier style of beers, new Repeal Reserve comes packaged in a vintage Budweiser stubby bottle. As part of the launch, the brand is bringing the Prohibition era to life by unveiling a fleet of antique cars in partnership with Lyft, Budweiser’s preferred safe rides partner. On Wednesday, October 25, New Yorkers (21+) will have a chance to score the Bud Vintage Mode for a ride in an authentic, vintage car to experience the 1930’s first-hand, between the hours of 3-7 pm ET by visiting www.lyft.com/BudVintageMode. During the specialized ride, passengers will cruise through the famous streets of New York, passing landmarks and neighborhoods that were integral to Prohibition, while learning about the newly released beer. From New York and beyond, fans can experience a taste of history with Budweiser as part of Repeal Reserve’s full marketing campaign inclusive of new TV commercials, digital content and Clydesdales appearances. Budweiser is also partnering with Drizly to deliver a taste of history to beer drinkers across the country with a special code for $5.00 off their first purchase of 1933 Repeal Reserve, using the code Prohibition. To score a ride in the Bud Vintage Mode with Lyft visit www.lyft.com/BudVintageMode. For more information on 1933 Repeal Reserve, visit Budweiser on Twitter, Instagram, Facebook and YouTube. Print article This entry was posted by Art Eddy III on October 23, 2017 at 11:40 am, and is filed under Lifestyle. Follow any responses to this post through RSS 2.0. Both comments and pings are currently closed.